The Optimistic Desk Clock may not be able to make time go faster but it will help you focus on the only two digits on the clock which matter - 5 and 6 which means only one thing…. home time! 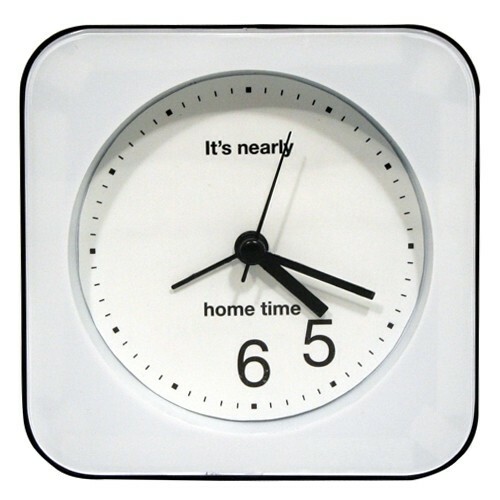 Perfectly sized to fit on your desk, you can now keep a track of time without having to rely on the office wall clock. The Optimistic Desk Clock allows you to clock watch in peace without anyone else noticing, particularly your boss. You can now keep track of the time without having to keep looking up at the office clock. Also comes with a built in alarm so you don't have to spend a minute more than you have to in work. A fantastic gift for people who can't wait for home time! Approx Dimensions-10 x 10 x 3.5 cms.